“We match,” she said with a smile and then stuck her foot out, while putting our shoes side-by-side. We were wearing the same exact shoes during the interview, just in inverse colors. The Nike PG 2.5s. If you’ve watched a game of basketball this year, you’ve seen someone wearing them. Like many basketball players, she has an affinity for shoes, but not the shoes you may think a Division I college basketball player would own. This is junior Mary Dunn, the 6-foot-3-inch forward for Youngstown State University’s women’s basketball team. Dunn received the Horizon League Player of the Week for the week of Jan. 7. 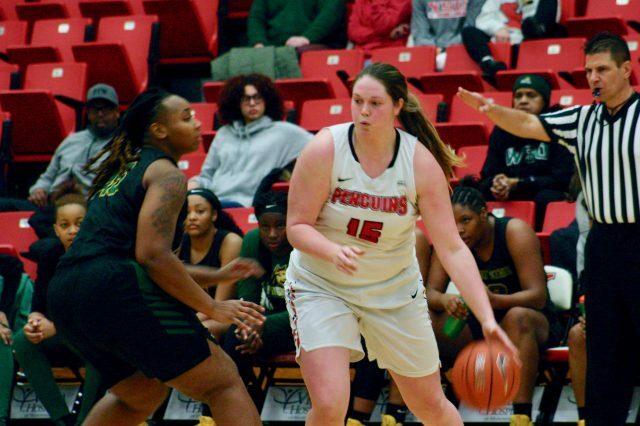 During that week, she averaged a double-double with 21.5 points and 10 rebounds, while shooting .857 from the field in the Penguins two victories against Indiana University – Purdue University Indianapolis and the University of Illinois-Chicago. She was also just named Horizon League Player of the Week for the week of Jan.28. This marks the second time she’s received the honor this season. Statistically, this is Dunn’s best season on all fronts. She’s on pace for a career high 426 points and has already surpassed her totals from her sophomore year, where she scored 219. This tops her first year as a Penguin where she was named Horizon League Freshman of the Year. She led all conference freshmen averaging 11.3 points per game and a .514 field-goal percentage. Dunn led the Horizon League in multiple raw totals, as well. She scored 315 points and grabbed 110 rebounds while blocking 19 shots, the best on the team that season. Dunn had a brief slump during her sophomore campaign seeing her points-per-game dip to 6.8, but has come back this season better than ever, notably growing as a defensive threat. One aspect of Dunn’s game that has really grown this season is her three-point shooting. She is shooting 8-of-19 from behind the arc and has both attempted and made more three-pointers this year than her first two years combined. That confidence has come from working over the summer. Dunn’s love of the game came from her parents. While it’s always been there, the love has only grown since coming to YSU. That love shows just as much on the court as it does off the court. 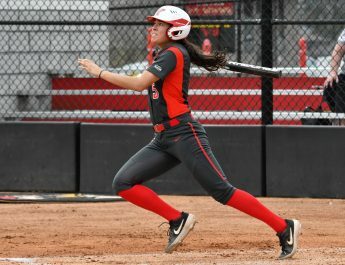 During games when she’s not playing, Dunn is on the sidelines smiling and hyping her teammates up, which she said is part of her role as captain. Dunn is a communications and sociology double major, and she plans on getting her doctorate and possibly become a college professor. When she’s not on the court, Dunn is like any other college student. Listening to music, hanging out with friends and watching TV. “Outside of basketball, I like to just hang out with my friends and I go home a lot. I’m a big family person, and I’m only a hour and a half away,” she said. Being a big family person is what brought her to Youngstown. Dunn is from Washington, Pennsylvania, a city about 30 minutes south of Pittsburgh. She wanted to stay close to home and chose YSU because it felt right on her visit to the university. Before coming to YSU, Dunn was a star at Trinity High School. She was named third team Interscholastic Athletic League all-state in Class AAA, as she averaged 17.6 points and took Trinity to the Western Pennsylvania IAL Championship Game for the first time in program history. In her third year with the Penguins, Dunn has made a lot of memories, but still has her eye on making one more. The Horizon League tournament begins March 5 at a to-be-determined time at the Little Caesars Arena in Detroit, Michigan. Until that time however, you can catch walking around in her Vans.